Dispenses treats through a KONG-shaped hole near the top. Unpredictable movement keeps the toy challenging, even for seasoned Wobbler users. 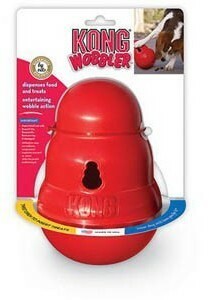 Suitable for all dogs weighing 5kg or more. Unit H x W x D 10.5" x 7.0" x 6.5"